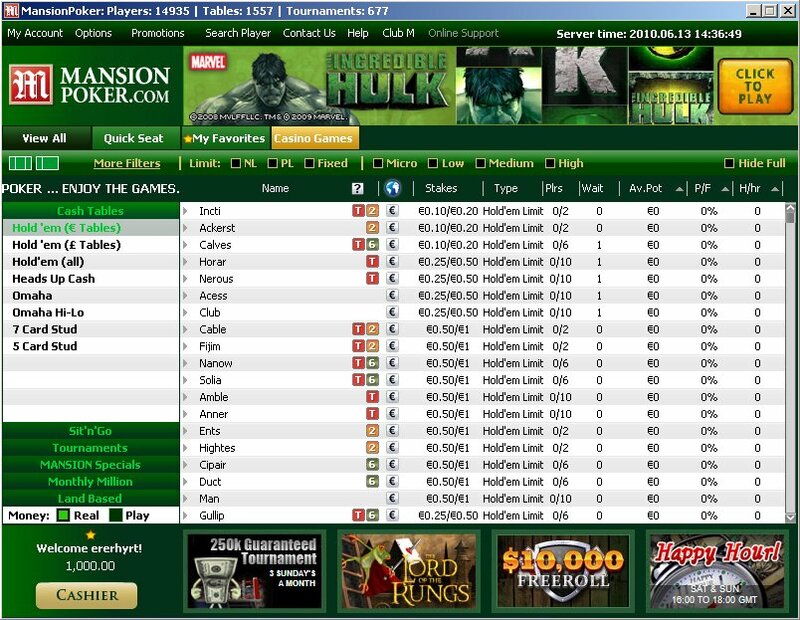 Mansion Poker is a lesser known poker room on the iPoker Network. This online poker room is a nice solution if you want to start over from scratch, for instance if you have an account at Titan Poker or Celeb Poker, but wasted your initial deposit bonus. As Ocean Poker uses the same software as all other poker rooms on the iPoker Network, i.e. the poker room software developed by Playtech, you can rest assure that you will enjoy a good game of poker on a solid poker platform with thousands of players. The iPoker Network also guarantees a fair amount of interesting promotions, such as several satellites, cash ladders, the ECOOP (European Championship of Online Poker), and more. The main reason that Poker For Free decided to promote Mansion Poker is because they have offered us to run weekly freeroll tournaments. This means that you have a good reason signing up there. In the following part of our Mansion Poker review you can read in-depth information about Mansion Poker's client, website, security & integrity, traffic & games, bonuses & promotions and support. Mansion Poker uses the software developed by Playtech, a renowned gaming software developer listed on the Londen Stock Exchange. The online poker room features all standard poker room functionalities, such resizeable tables (mini view and full screen option), a buddy list to keep track of your friends and enemies, player notes, real-time game and hand history, an in-game cashier where you can track all your transactions, and last but not least the option to get in touch with support instantly. Game statistics integrated in Playtech's poker rooms are generally known to be better than most other poker rooms, thus this is also a true fact for Mansion Poker. When playing cash games you can see the amount of Poker Points that you've earned. If you are a bigger type of poker player you're able to fill up your screen with up to 16 poker tables. Unfortunately, both the website, as well as the installable client that Mansion Poker provides are only available in the English language. As part of the iPoker Network, Mansion Poker makes use of a solid and secure poker platform developed by Playtech, where you will experience a maximum level of security while playing online poker. The poker room is secured with 128-bit Secure Sockets Layer encryption, to ensure you that your personal data is highly protected and can't be accessed from anywhere else than the poker client and the poker server. All data provided to open and use a Mansion Poker account will remain confidential (meaning it won't be sold to any third parties) at all times. Players on Mansion Poker are protected from collusion as Playtech implemented mathematical analysis programs, as well as human observation, to detect anything irregular going on at the tables (abnormal betting patterns or co-operation among players). Traffic at Mansion Poker is outstanding. The iPoker Network hosts games to thousands of online poker players worldwide. At peak hours you will easily see 30,000 to 40,000 players logged in, while this amount will easily be exceeded during special promotions such as the ECOOP. Just as any other online poker room, traffic at Mansion Poker is mainly concentrated around the Texas Hold'em games. Other games that you can play at Mansion Poker are: Omaha (High, and Hi/Lo), 7-Card Stud, and 5-Card Stud was recently added as well. Pot Limit Omaha is one of the most popular poker variations besides Texas Hold'em. The games are available in all common betting structures. Fair is fair, the Mansion Poker website is really outdated, it's of too bad quality to be true and we can't come up with anything positive about it. But then again, this has nothing to do with the online poker room they represent, and from our sources we have heard that a new website is planned to be launched half way 2010. The only thing you really need to know about MansionPoker.com is where to find the download button, and that's made pretty easy as it never slides of your screen. The download button can be found in the left column of the website. 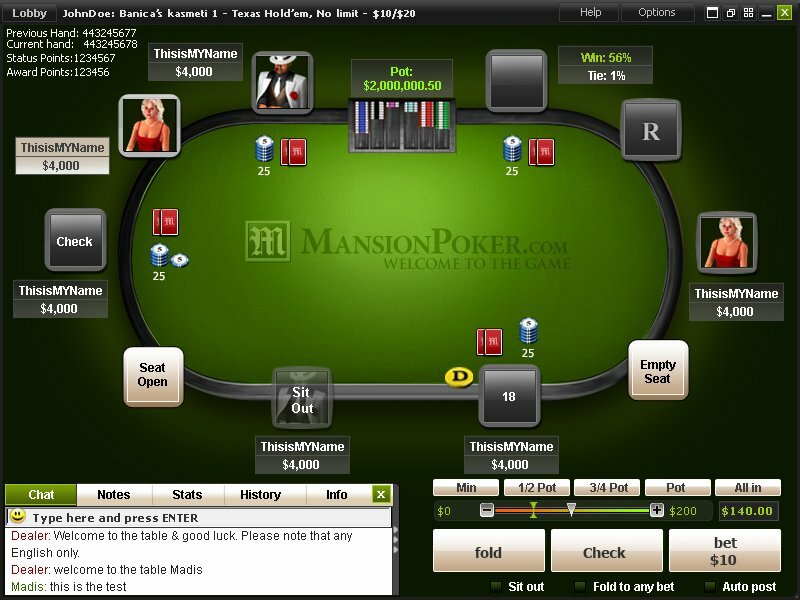 Mansion Poker offers live support, which is highly recommended. You hit the in-game support button and before you know it you're chatting with a representative. 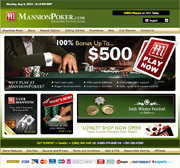 Besides live support, you can get in touch with the Mansion Poker support department over the phone, or via e-mail. They have e-mail addresses listed on their website for different purposes; support, deposits, withdrawals, games, tournaments, marketing and feedback. Make sure to have your Mansion Poker screen name available when contacting support any other way than via live chat.